Classic postcards for pressie or a great memento! 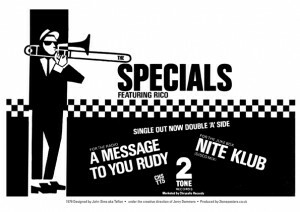 Looking for that classic great pressie or simply a great memento of 2-Tone ART. We have now added to the Shop 8 designs in A5 glossy size postcards to buy at £2.50 each (P&P extra) or just £9.99 (P&P extra) for the complete set of 8. Look great framed! You are currently browsing the classic 2-tone graphics news archives for November, 2009.